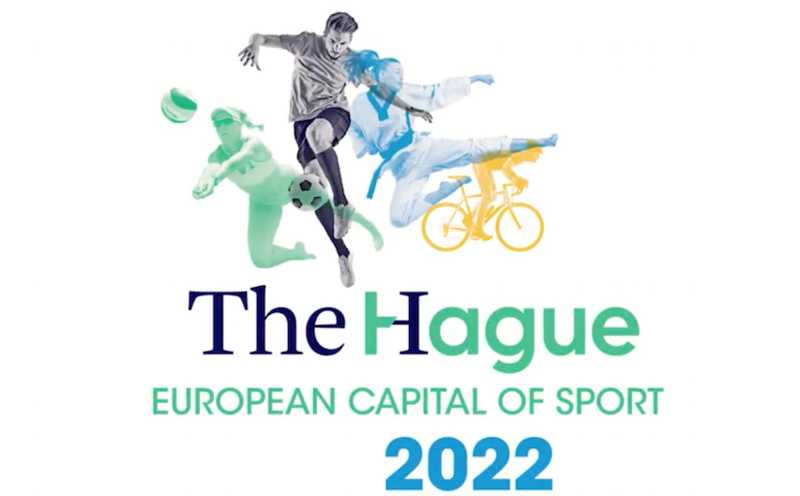 Did you know that The Hague will be European Capital of Sport in 2022? The Feel at Home Fair on 4 February, will celebrate many of the things which contributed to that prize. Take a look at this rousing video. Do you recognise your home region? At the Fair you can find your part in that story. The theme of the 2018 Feel at Home Fair will be Sport, Leisure and Wellness and it’s all about being a good sport: that is being active AND taking part in good spirit. And a whole load of sport!!!!! As it’s January and we haven’t got the footage for a video yet, we’re going to take you on a virtual tour. As you enter The Hague’s City Hall, the first thing you will notice is that the so-called ice palace is not cold at all: it is made warm and cosy by around 4000 visitors and stand-holders, filling the enormous space with their activity and laughter. 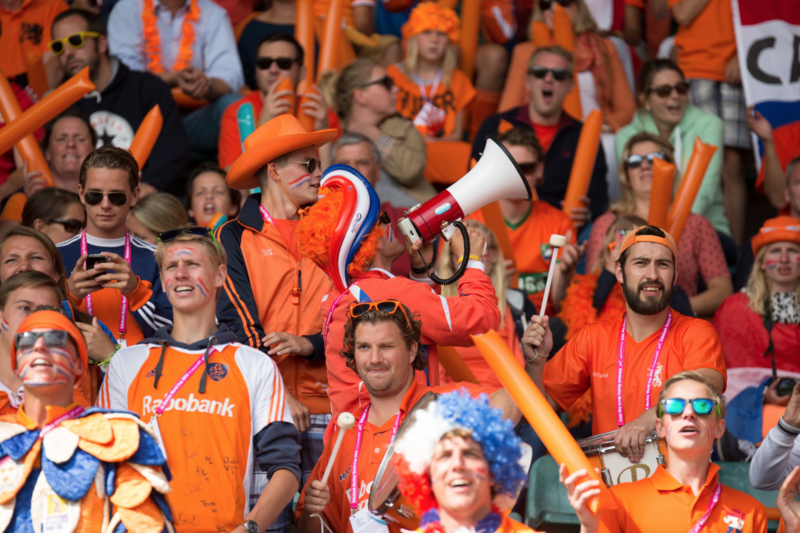 On the way there, you’ll pass Rabobank, sponsors of the Dutch Hockey team and 75% of the nation’s hockey clubs. Why are the Dutch are so crazy about this sport? Walking into the main exhibition hall, you’ll see many other sports represented, some you maybe haven’t heard of, like korfball, floorball and Tang Soo Do. Don’t worry, throughout the day on Central Park there’ll be demonstrations to show you how they’re played. Language is no barrier with sport -the rules speak for themselves. Besides competitive sports like cricket, volleyball and judo, we’ll be showcasing other ways to be active, like gymnastics and dance. You might even want to join in.. 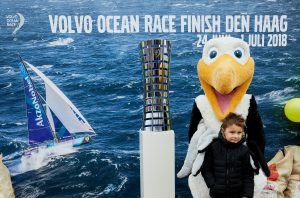 The fun doesn’t stop on Central Park: at the stands nearby The Volvo Ocean Race Team will challenge you to hoist the sails, while Westvliet’s coaches will put you through your paces with some fun circuit training. The City will be showcasing upcoming events like the World Judo and Volleyball Championships and 2020 Special Olympics. And they’ll be looking for volunteers. Tired already? Take a break upstairs in the International Food Court. Enjoy your food and drinks out on to The Balcony to get a bird’s eye view of the action below. While you’re there, you can pay a visit to around 40 Social & Community Clubs who’ll be vying for your attention and your participation. From theatre groups to churches, charities and photography clubs, there is plenty to interest you while you get your breath back. Also upstairs, in the Meeting Room suite, the Workshops will be in full flow. Check out the full programme on the website: www.feelathomeinthehague.com to find sessions of interest you. 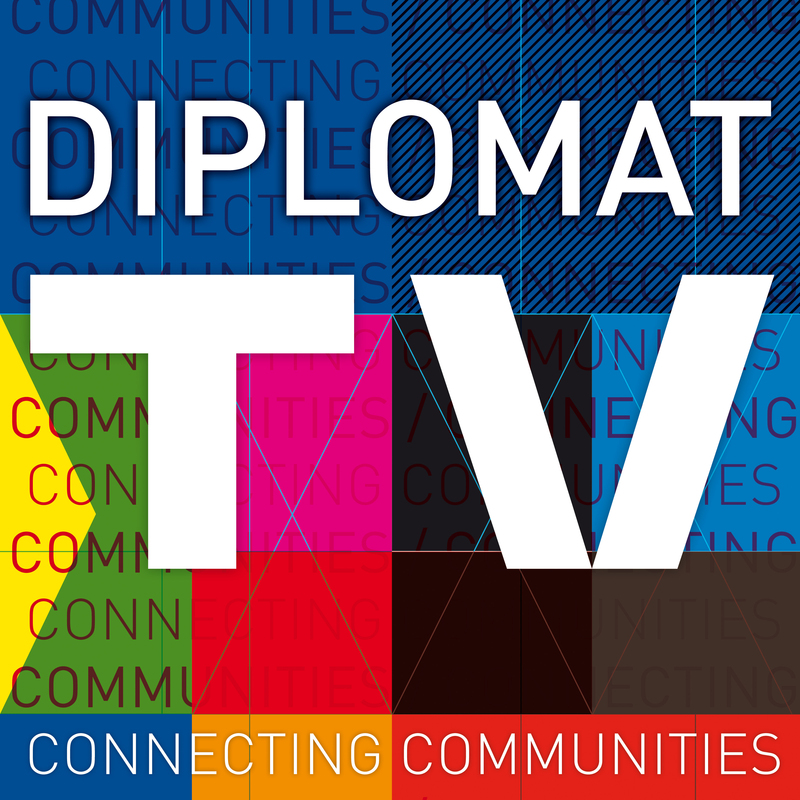 The Fair’s theme, Health and Wellness feature strongly, but so do many other topics, from careers and tax advice to public speaking and information on the forthcoming local elections. The balconies wrap right around the atrium, giving a clear view down to other activity areas in the Fair, such as the School Plein, a kiddie version of Central Park, with the region’s International Schools playground gathered round. Watch the fun and games in the mini-workshops on the playground. Time for more action! Back downstairs, the coaches are waiting for you in Decathlon’s Gym. They’ll show you the latest equipment and work-out techniques to put the excesses of the holidays behind you. Browse the shops in our miniature Molenstraat on your way to The Sports Hall, where an impressive selection on the region’s Sports Clubs will be gathered. Athletics, tennis, rugby, sailing, lacrosse, badminton, cricket and cycling groups from throughout the region will be represented. You’ll have the chance to meet the members and get a feel for where you’d fit in. It’s hard work walking the length and breadth of the enormous City Hall, and you’ve been active, so you’re bound to be thirsty. Check out the rugby score at O’Casey’s Irish Sports Bar. Global Winners of Best Irish Community Pub and sponsors of several local sports clubs, it’s fitting to have a miniature version of this favourite local at the biggest international community Fair. Catch up with friends over a pint of Guinness, watch Top Sport on the Big Screens or chillax with some traditional pub games. On the other side of the Sports Hall, our nominated charity will be serving something quite different: The Krajicek Foundation tennis challenge could win you tickets to the ABN AMRO World Tennis Tournament in Rotterdam this February. Learn about their inner-city playground schemes and meet their young sport scholars, while practising your serving technique. That’s it: you’ve completed the (Virtual) Grand Tour! Hopefully you’ve bumped in to some friends, been entertained and learnt something new about your region. And now you really Feel at Home! If you’d like to do the real thing on Sunday 4 February, register for your FREE TICKETS now. 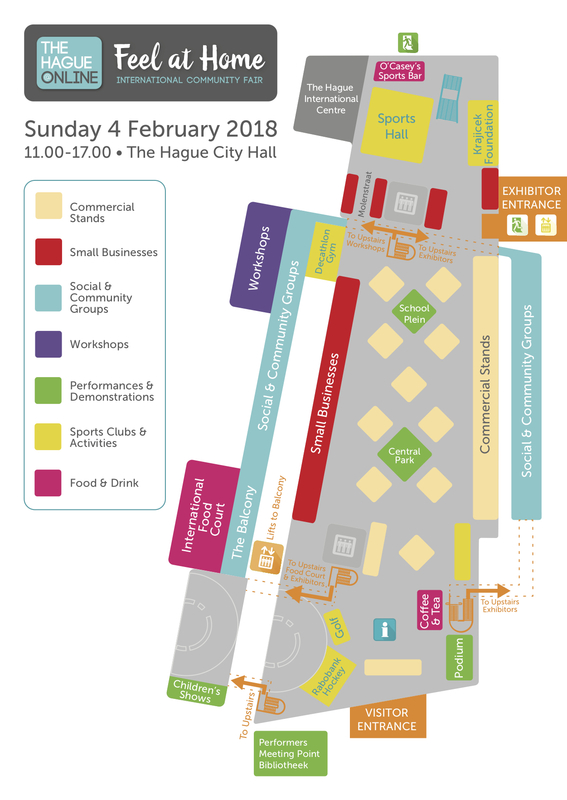 You can use the link here or on the website: www.feelathomeinthehague.com where you’ll find lots more information, including the List of Exhibitors and the timetable for the activities and the Entertainment and Workshop programmes.